Two bedroom self catering semi detached bungalow. (Parking for your car at rear of bungalow) Looking out over green fields from the front, and sea views from the bedrooms. The holiday village of Brambles Chine is only yards from the sea and has direct access ,via a slip way, from front door to the beach is 3 minutes walk. (Beach is child friendly with some Pebbles mostly Sand) Brambles Chine has a putting green,children's play area, and a small shop. Colwell bay has a child friendly sandy beach with plenty of rock pools, ice cream shops and a restaurant. The nearby harbour town of Yarmouth is very picturesque and pretty, where the Wightlink car and passenger ferry crosses from Lymington. Freshwater Bay Golf course 18 Hole, Is only 2 miles away, The Best Golf course on the Island. Please contact us for longer or shorter stays we will always try to accommodate you. Payments can be made by Pay Pal, Bank Transfer,or Cheque . Hello, Welcome to THE LYTTLE HOUSE. We Live on the Mainland in Bedfordshire, Pretty in its self but not a patch on The Isle Of Wight. Barry grew up in Co.Cavan, Ireland, another beautiful part of the world, and I (Gayle) in dear old Bedfordshire. We have wonderful neighbors Dot and Eddie who are very kind and look after The Lyttle House for us. They live on the Island and are a mine of information if you need any tips on where to go and where this is or that is. if you read our feed back nearly every one mentions our lovely neighbours. My brother moved to the Isle of Wight, we had lots of lovely holidays on the Island. Then thinking of buying a house boat, my brother suggested Brambles Chine, We came up to just have a look, nothing more. just look......... Well 9 or 10 years on you know what happened, so pleased the look turned out to be a buy. Now hoping we will retire to the Island one day. sorry we have no landline but our mobiles work fine. Gas central heating, set your own temp with dial on the wall. Radiator Heating in every room. Beds will be ready and made up for you, Bath and hand towels are provided. please bring your own beach towels. washing liquid is also provided, washing line and pegs are at the rear of the bungalow. Private drive parking at the rear of the bungalow. 2 seater leather sofa and two leather armchairs. Milk,Tea, coffee, sugar. orange squash and biscuits, all there so you can have a cuppa before you start to unpack, Salt. pepper, and odd bits I leave so hopefully you won't have to buy. plenty of dishes and utensils so you only need to load dishwasher once a day. enjoy your meals looking out to the front (see pics) WE love to eat breakfast watching the cows in the field next door. Patio and table and 4 chairs. We had a great time , the cottage had everything ,and more for a fantastic holiday. The road down is not the greatest, but our stay was really nice, The cottage has everything you need for an enjoyable holiday. We tried to book for the summer, but it was full for the two weeks we wanted. Beautiful location, really peaceful and the chalet was clean and charming, Dot next door was a star! Oh thank you . So pleased you liked our Lyttle house. Yes Dot our key holder is a star, we would be lost without her. My family really enjoyed our stay in Brambles Chine and our holiday on the Isle of Wight, so much to see. Our holiday chalet was fully equipped with everything we needed and more. 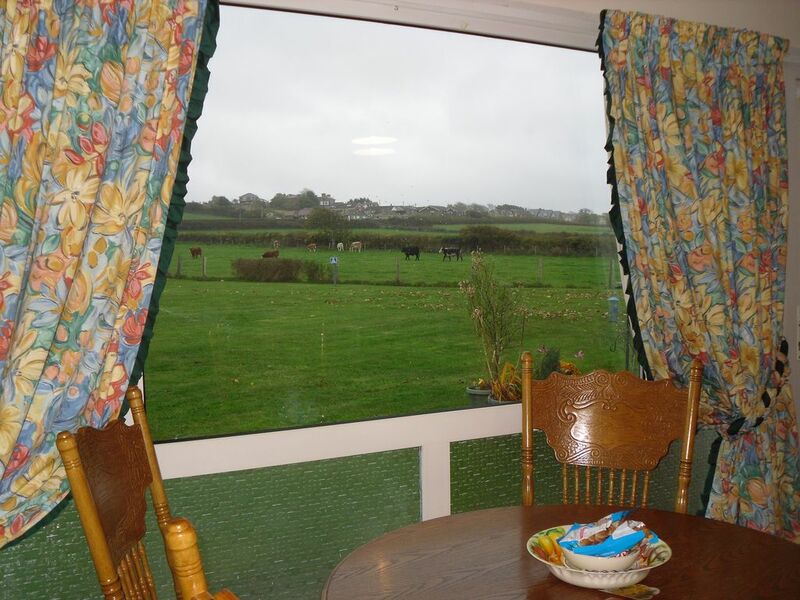 It was nicely furnished and perfectly situated with a lovely view of the cows in the field and a sea view from our bedroom window, with only a 5-minute walk to the beach where the water was warm and clear. You can even see the Needles from the hilltop at Brambles Chine and the beach itself. The beaches are very clean and ideal for swimming, watersports and sunbathing. A short walk along the Colwell Bay seafront you will find a few places to eat, one being The Longbeach Bar where we had a few evening meals. Brambles Chine is a very friendly place to stay, with lovely neighbours next door and good contact with the owner. Highly recommended and will definitely come back for another holiday. The Lyttle House is a very nice property in a holiday estate, a couple of minutes walk off the beach. It has everything you may need for your there and the neighbours next door who actually check you in and out are very helpful. The communication with the owners prior to our stay was easy and they provided plenty of information. We were with two young kids and the proximity of the beach helped us a lot to keep them entertained. Lovely location, peaceful and only a very short walk to a lovely beach. The bungalow was very well stocked with items you may have forgotten to take with you. Dot and Eddie next door were so helpful, a delightful couple. We will certainly be returning at a later date. Enjoy the soft sandy beaches of the isle of Wight, nearest is less than 3 minutes walk. Beautiful views across to Old harry rocks at Swanage, and Hurst Castle less than two miles across the waters of the Solent. This four person bungalow offers a perfect location for enjoying the sights and sounds of the island, whether by foot, car or bus.it is an ideal base for water sports, swimming, fishing, fossil collecting, walking, superb sandy beach with a cafe, plenty for the children. The historic and picturesque harbour town of Yarmouth is nearby with ferries to the mainland on a regular basis. Many interesting places to visit The home of Queen Victoria, Alfred Tennyson and many more; Visit the castle at Carisbrooke where King Charles spent his last night. Of course there is the delightful Freshwater, only a stroll away for shops pubs and food. When booking please note £100 deposit will be required on your holiday.Non Returnable. Payment in full on day of arrival. Plus £100 deposit cheque or cash returnable on leaving against breakages. Bedding (Beds made up) and towels (1 Bath and 1 Hand Towel per person) included in Price. Also welcome pack Tea, Coffee, Sugar. Milk. Biscuits. Washing up Liquid.Toilet Rolls.